On the 15th day of Chinese New Year we celebrate Yuan Xiao. In the old days, as children entertained themselves with paper lanterns of all shapes and forms, grown ups would solve riddles and puzzles, while others worked in the kitchen, preparing the glutinous rice flour to make Tang Yuan (glutinous ball in soup), meticulously filling each and everyone of these white balls. As a chubby toddler, I looked forward to playing with Rabbit Lanterns every year. Some traditions have been lost over the years, kids don’t put down their video games for these old school kind of fun, it’s truly a shame. Bright colorful lanterns can only be seen in busy shopping areas now a days, at least in Shanghai. Thankfully the eating part has been some what conserved in each family, though most likely store bought rather than made from scratch. Tang Yuan (glutinous ball in soup, served HOT) is eaten to symbolize “togetherness”. Tang means soup, Yuan means round, but also reunion/being together, hence the idea of eating this “round” ball with your loved ones so that during the year, everyone stays close to one another. It’s such a heartwarming tradition that most families keep it alive. Tang Yuan comes filled with a variety of sweet and savory options. Black sesame is my favorite and also the most popular, but you can also find them with red bean, peanuts and a savory pork (not sure if it’s Shanghainese thing). They’re the perfect dessert year round. 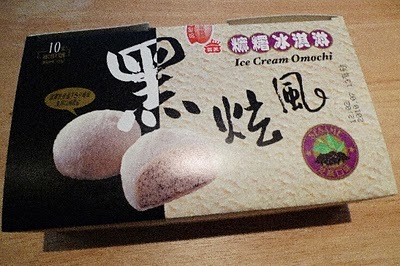 This year, as I wondered the Chinese super market on Kissena (Flushing), looking for some Tang Yuan, these Black Sesame “Ice Cream” Non-Tang Yuan (or mochi) screamed ma’name. It’s not your traditional hot Tang Yuan in soup, but my Yuan Xiao had nothing traditional to begin with, so this was perfect. 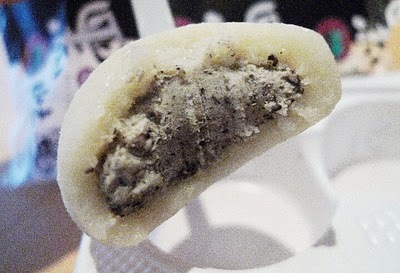 Deep fragrant black sesame ice cream is covered with a soft stretchy glutinous wrap. Just the right amount of sweetness and a fun-filled texture sensation of icy cold with a nice chewyness, it’s really an awesome dessert to share with loved ones on Yuan Xiao or any other day of the year. I love tang yuan! Man . . I really should make some, even though Chinese New Year is past!